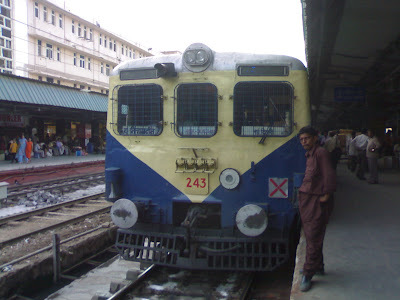 This is the Delhi EMU train, the former lifeline of Delhi. Now Delhi Metro has taken over gracefully and in amazing style. The EMU trains are still used by a lot of people living in the outskirts of the city and commuting daily to the Capital of India for work. What a beautiful old train! And I love the background of the people waiting for their train..all the lovely colors of clothing. More vintage Delhi please! Yay to your upcoming 100th post!!! The gentleman in front of the train is seriously posing for this picture! Did you tell him people across the globe would be seeing him?